Swim 2017 Kicks off with €1,000 raised by Arklow school. 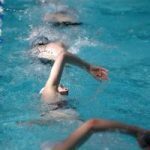 The 2017 Ian Daly Swim A Mile event kicked off early on December 16th when 33 students from Gaelscoil Na Mara in Arklow completed the swim in the National Aquatic Centre in Dublin. Most of the students completed the swim in a relay as groups of two. There were also 9 brave students who completed the 64 length mile swim individually and were rewarded with a special ‘Ian Daly Swim A Mile’ swim cap. As you can see from the pictures the swim went off very well and everyone had a great time. The school has raised over €1000 so far for our two charities, Crumlin Children’s Hospital and Barretstown. Well done to all the swimmers and to the teachers who promoted the event in the school, led by Áine McKenna.